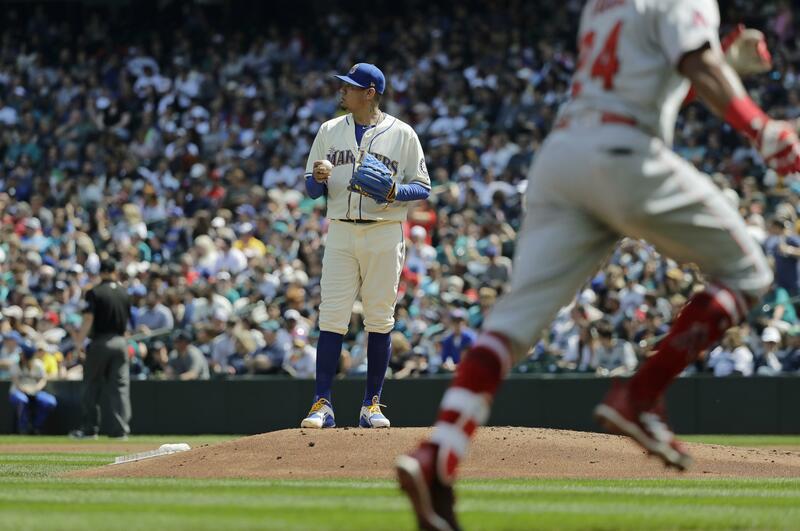 SEATTLE – If they could have rustled up 23-year-old Felix Hernandez to go head-to-head with 23-year-old Shohei Ohtani, then they might have had something. But that was about 2,000 innings ago. And if the Seattle Mariners could roll back that odometer, surely they’d try to do more with a young Felix than goose a Sunday afternoon gate in May. Maybe, you know, something in the alien land of October. In any event, the weekend at Safeco Field reaffirmed again that baseball does much better with accidental theater than with anything anticipated. Also this: Felix vs. Shohei might make for a nice fight poster, but the best reason for anyone to pay to get into a ballpark in 2018 remains Mike Trout. Any other big-picture conclusions will be drawn from mere hints scattered through what was only the second series the Mariners have lost this season – an 8-2 spanking by the Los Angeles Angels on Sunday making for a rather disconcerting getaway after the wild promise of Saturday night. Some of the adrenaline from that one still coursed through the Seattle clubhouse the next day. Rallying from four-runs down, the M’s had pulled out an unlikely 9-8 victory despite ace closer Edwin Diaz giving up a tying home run one strike from nirvana and the Angels scoring go-ahead runs in both the 10th and 11th innings. It had been 15 years since a team had surrendered runs in the ninth, 10th and 11th and still won – the M’s being the party of record then, too. They sent a big crowd home dazzled and rightly saluted themselves for hanging tough, only to get carried with the kind of pronouncements that are always pooh-poohed on it’s-just-one-game Opening Night. Hey, it really did feel that big at the time. But that’s the bummer of baseball. Momentum is a nice theory that has to be reproven each day. The M’s had maybe 12 hours to juice on the heroics of Saturday night and now they carry this one around for a month before they can play the Angels again. Not that the Mariners shouldn’t have anticipated resistance. After all, they were up against the sexiest story in baseball in Ohtani – rope-hitting DH one day, seed-throwing sensation the next. Hernandez joked that “I was doing that in Little League,” but there isn’t a Mariner – or a major leaguer – who isn’t impressed. Here’s the kind of thing he can do: Against Mitch Haniger in the fourth inning, Ohtani fell behind in the count 2-1, then pinned a 99 mph fastball on the outside corner at the knees and followed it up by burying a slider that had Haniger flailing for strike three. Ryon Healy finally took a slider over the fence in the seventh, but it was the rare hard-hit ball. “His stuff is real,” acknowledged Seager. Hernandez’s stuff has been real for 14 big league seasons now, but it’s also in decline, something that’s getting harder to disguise. Like Gonzales the night before, he scuffled in and out of trouble, but gave up two second-inning home runs on nothingburger pitches up in the zone – making nine already this year, one reason his ERA is 5.28. Well, he needs to pitch in good luck, too. When he bounced a two-out, strike-three curveball in front of Mike Zunino that went for a wild pitch, it ushered in a four-run Angels sixth inning – Trout crushing reliever Chasen Bradford’s first pitch for three of them. Trout. The Mariners remain his muse. He had a double off Diaz on Saturday night before Justin Upton’s tying homer – Seager cited that as a more impressive at-bat than the dam-breaking homer Sunday. He had nine hits for the series. Yes, he does – Upton, Ian Kinsler, Zach Cozart. This Ohtani fellow is pretty good, too. The Angels’ rotation might be as questionable and delicate long-term as Seattle’s, but the M’s did nothing against it this weekend, hitting just .235. Seattle’s starting pitchers battled. The Angels owned. Time obviously remains to change that narrative. Or to take its toll. Published: May 6, 2018, 9:30 p.m.